Over the last few years Apple Education has released a number of interesting free interactive guides designed specifically for teachers and students. We have already featured some of these guides in previous posts; however, today we have compiled all of the available guides into the chart below so you can easily access and view the ones that you want to use in your class. From learning how to use popular iOS apps to exploring iPad and Mac's hidden tips and tricks, these guides are definitely worth checking out. You may want to bookmark or save this page for later reference. 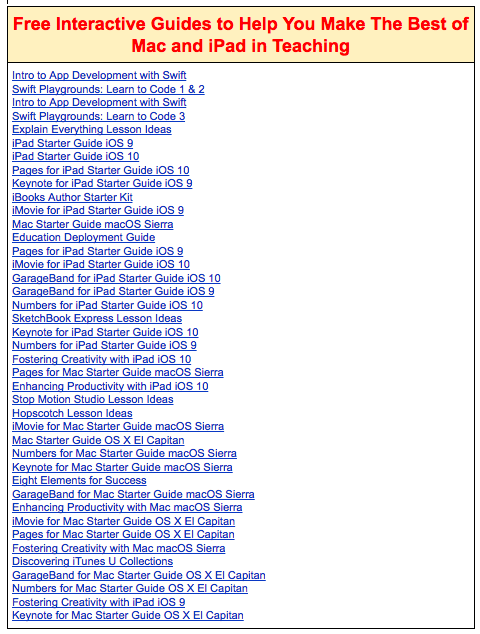 All of the featured guides are available for free download with iBooks on your Mac or iOS device.